My old roommate in San Francisco A taught me how to make pasta. When we were living together in the bay area many years ago, I was in charge of making Malaysian and Chinese food in the kitchen, while A excelled in western food. If A were to read this post today, I am sure she would be amazed by my newly acquired cooking skill. To make it an ultra luxury dish, I got some fresh Florida rock shrimp. Both crunchy and succulent, Florida rock shrimp is worth every buck I spent. (They were priced at $19.95 per pound.) Throw in some calamari rings, scallops, shrimp, mussels, cherry tomatoes, and freshly-plucked sweet basil leaves, you have a 5-star dish that you can make anytime to impress yourself, or your guests. Click the above gallery to view the complete pictures set; a total of 8 pictures for your drooling viewing pleasure. Bring water to boil in a pot and add in the mussels. As soon as all mussels are open, transfer the pot to the sink and drain the water. Rinse the mussels with cold water to get rid of foams. Set aside the mussels. Bring water to boil in a pot. Cook the angel hair pasta according to the instructions on the package. While boiling the pasta, heat up a deep saute pan with some olive oil. Saute the garlic for 30 seconds. Add in all seafood except the mussels. Once the seafood are cooked, add in the mussels and cover the saute pan for about a minute. Add in oyster sauce (or salt to taste). Lower the heat to low. Drain the cooked angel hair pasta and divide them equally into 3-4 servings. Dish out the pasta sauce and pour it on top of the angel hair pasta. Garnish with cherry tomatoes, sweet basil leaves, and spinkle some dried parsley flakes on the dish. Serve immediately. I used Prego brand traditional pasta sauce for this dish. See my new napkin? Isn't it cute? $2.00 each at Target! Fruits of the sea *chuckles*…Now where’s that box of Kleenex :) Napkins made by my employer? Hahaha..
Beautiful dish! I’m drooling!! I always have some homemade tomato sauce in my freezer, and now that the basil is starting to grow in the herb garden, I’m all ready for this recipe. wahhh…looks so gorgeous! Wanna try this soon…maybe tonight….u’ve started a craving!!! hehehe. Ok! I am a vegetarian and have nothing to comment on the recipe. But, it is easy to make pasta in sauce look gross. You have done an admirable work in taking such a luscious photo! Definitely worth the wait…soooo delectable. You won’t want my drool all over or it will dirty your new napkin. ;) The 料 so much that cannot see the pasta (can pass off as paella) …definitely more than 5-star. Your shrimps fresh from the tank? Recently I got myself some Florida Key West Pink Shrimps too. Tell you what…why don’t you move back to Malaysia and start cooking these for us back home to eat! You’re killing us with your recipes! Droolicious! my favourite, my favourite!!!!!! and WOW…… so beautiful!!!!!! Looks like more ingredients than noodles. Yummy! 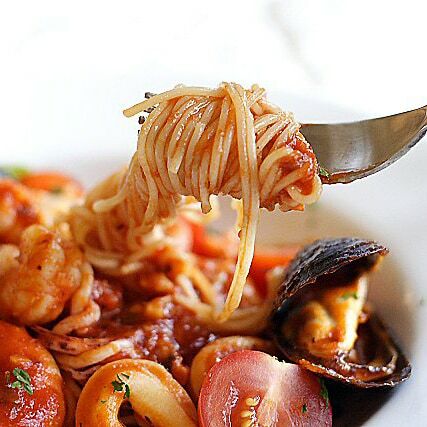 I like pasta and looking at the dish has already made me salivate… It looks really delicious! Wow! good food and great pic..Just make pasta for son#1 with prego sauce with only chicken meat and button mushroom.No mussels.. etc..next time will try your recipe.. thanks for sharing..
Nice photos! Thank you for your comment on my blog. Have you tried out making pandan chicken? Keep up the good work of you blog! wah … this is exactly I’ve been dying for. Shiok! Great photos. Love the dish too. Did you take the pictures yourself? The pasta looks DELICIOUS! I always try to make a sophisticated pasta dish but it never turns out as good looking as this one! Great photos yet again….THAT’S IT! I wanna move to the States to be your neighbour! Very nice, although I would have used canned tomatoes and mashed them in the can to make sauce. Bottled sauces tend to have lots of sugar in them. Unkaleong – haven’t u learned your lesson by now? Have your Kleenex tied to your neck the next time…hehe. Lemongrass – did you get your fix? Suganya – wow, a vegetarian commented on my non-vegetarian dish. Thank you! Tiga – where did you get the Key West Pink shrimp, sounds so exotice, I must try. Tell me where to go them pronto! I will try them when I come back from Asia. Pablo – OK, you will hire me to work for you then I go back and be your neighbor. Hehe. Wokandspoon – you are right…I always stain my shirt whenever I eat tomato sauce pasta. LOL. Joe – yes, it is very easy to make. Tummy – this is “keh liao” one…of course ingredients more than noodles. Wahahaha. Teckiee – exactly, I do not like pasta when they are all pasta and no ingredients/topping…boring. Bayi – hehe…I warned you so. East Meets West – thank you. Sweet Jasmine – cool, I hope your son would love my version. Leemei – yes, indeed I did. But my pictures weren’t as good as yours…hehe, they were delish. Singleguychef – you are too humble…I am drooling over your gourmet food…your creations are like Top Chef!!! Ben and Suanne – thanks. Mmm this looks sooo good! I’m drooling and hungry. Pasta with seafood is an unbeatable combination. Looks really rich, Bee. This must be first pasta dish I’ve come across on the blog. We call it Spag Marinara here. I prefer making the sauce from plum tin tomatos, onions and fresh basil. If you like something a bit tasty try Putanesca sauce- anchivies, garlic chilli, olives, capers, diced fresh tomatoes plus the tomato sauce. Oh yes the bak kut teh turned out a bit fishy. Mustn’t have washed the cuttle fish properly. Will try again soon. Manged to locate a Chinese medicine shop that sells the BKT ingredients. Love the colours as usual. Cheers. Wow, that looks really good. I always go to the Greek diners on Friday afternoons for the spicy seafood pasta dish because the Greeks don’t eat meat on Friday. Looks divine! and I just love how angel hair pasta “soaks” up all the sauces. Everyone seems to like Prego eh. The other day, my cousin also said she uses Prego. This pasta dish looks really good… I like it. Hey RM! your pasta looks amazing! As always, I love that youve used seafood, especially those juicy prawns. This dish is simply mouth watering! I like pasta especially with Seafood but my family don’t, so I hardly cook it. Your pasta is so good it made me soo hungry!! I have linked you, if you dont mind. yr recipe including yr very own foolproof pixs before general release meaning u airfly all yr ready cookings ( such as above ) for our test and a ok. I think that the addition of oyster sauce must have kicked it up a notch, because the pasta looks so gorgeous and the color is so much “deeper” than regular pasta sauce. This sounds like a great and relatively time-efficient meal. And I DO love those Target napkins! ahhh, i make the mistake of reading your blog when i’m hungry. the pasta looks so yum! Nice, share my favorite pasta sauce with you. Pomi, You can get it at Vons/Ralph’s. Totally different from Ragu. Pomi is not acidic and you can feel the made from scratch freshness. With basil and a magical pinch of sugar to bring out the flavor. Out of the three, I prefer the chopped tomato for the texture. you’re making me hungry with this angel hair pasta with seafood. Im going to try using all the seafood mentioned in your angel hair pasta with seafood recipe. I guess I’m gonna have to come back and hang out more on this site! Made this for my bf last night and he loved it! He’s asked me to cook it for him again already! This is so simple yet absolutely delicious! Highly recommended! Thanks for sharing this with us! I would make the sauce from scratch instead of using a jarred sauce, but this sounds interesting. I’ll be using fresh Louisiana oysters and white shrimp caught in the shallow waters of Louisiana (deep water shrimp has a weird iodine taste I don’t care for and shallow water shrimp is sweeter).